Here are some demonstration maps. Thank you for noting that the contents are often fictitious. A premium map done with Cartonord ©. The cartographic data of CartoNord (relief, topography) were injected in the map FokusMap to highlight local touristic activities. Demonstration of an illustrated map with route planning. Directly on the map and with an innovative graphic display. The best bars and terraces of Paris. This map was realized during the IFTM, for the start-ups of the Welcome City Lab. A paper version is available in our offices. 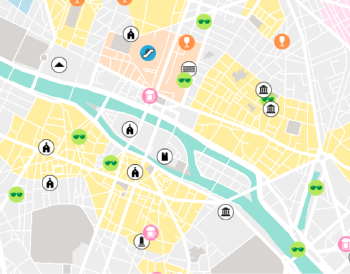 A custom-made touristic map, made in association with City Diary.